The map of Piri Reis, which was made circa 1520, achieved a level of detail of American geography, which according to experts, would only be achievable using aerial photographs. This incredible map challenges every single thing we know about our past, yet history books have completely omitted this incredible ancient document. There are a number of archeological discoveries that question our past, this is the case of the map which was found in 1929, during the restoration of the Topkapi palace in Istanbul Turkey, which describes in high detail the geography of the American Continent with such a precision that it looks as if it was put together with the aid of aerial photography. However, the map was made at a time when mainstream history tells us there were no flying vehicles on Earth and mankind’s technology was very limited. The map composed by Ottoman admiral Piri Ibn Haji Muhiddin Memmed, aka Piri Reis is in fact part of maritime navigation collection called Bahriye which is basically composed by 210 partial maps, dated around 1513 and 1528. The perfection and details displayed on the map have been the subject of debate for years among scholars who cannot understand nor explain how this map even exists. Today, numerous enigmas remain about the Piri Reis map, especially in regards of Latin America and the Southern regions of our planet. Recommended: Scientists Discover Forbidden Ancient Text That Teaches Superhuman Abilities! As a matter of a fact, the first exploratory navigation in search of Antarctica was led by British explorer James Cook, who launched the journey in 1772 and only managed to see snow and ice, 250 years after Pirir Reis had already drawn Antarctica on navigational charts. It wasn’t until 1819, when Fabián von Bellingshausen discovered the landmass of Antarctica for the first time, and it was in 1950 when American expedition Deep Freeze managed to “reveal” the geography of Antarctica. So, how is it possible that Pirir Reis managed to accurately draw the geographical details of Antarctica in 1513? With details that were not discovered until 1952? But that isn’t even the most interesting part of the Piri Reis Map. 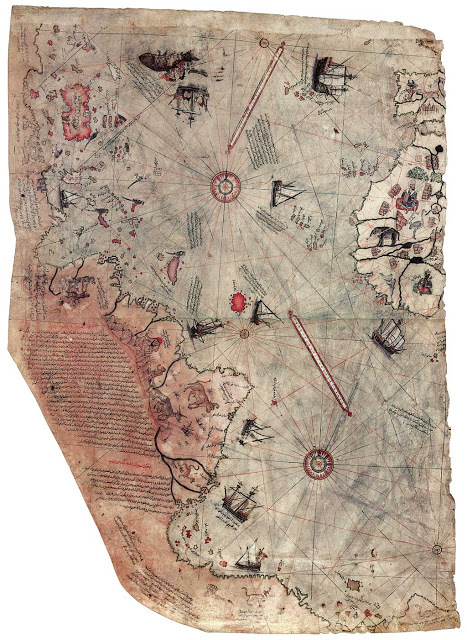 Inexplicably, the Piri Reis map depicts Antarctica without Ice, yet the Antarctica has been frozen for at least 6000 years. How is it possible that Piri Reis drew Antarctica without Ice? Where did he obtain this level of details? No one has been able to answer the mysteries surrounding this enigmatic ancient map. The only thing we can conclude is that, somehow, someone knew how our planet looked like thousands of years ago from the air… and the Turkish Admiral managed to obtain this information and create the most enigmatic map we have discovered to date, a map that challenges history as never before.